Mill Beck runs through this steep-sided valley towards Derwentwater, which it never reaches, and the River Derwent headed for Bassenthwaite Lake, which it does. This picture is taken near the crossing point of the beck prior to the steep ascent of Lower Man. The two firs in the foreground appear to be fugitives from the plantation. 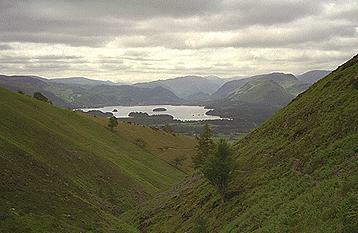 To the right of the lake lies Catbells with Maiden Moor behind and Dale Head further to the right. Beyond the lake is Castle Crag, with the higher Grange Fell to its left and Glaramara behind. Great End and the Scafells are to the right of Glaramara, on the horizon, and Pike o'Stickle is on the left, leading to High Raise. Larger version of this picture.